So my second appointment with the naturopath brought some unexpected challenges. Labour day weekend meant the shipment of my supplements was delayed, and I had to move my appointment to get to a funeral....basically, life happened. 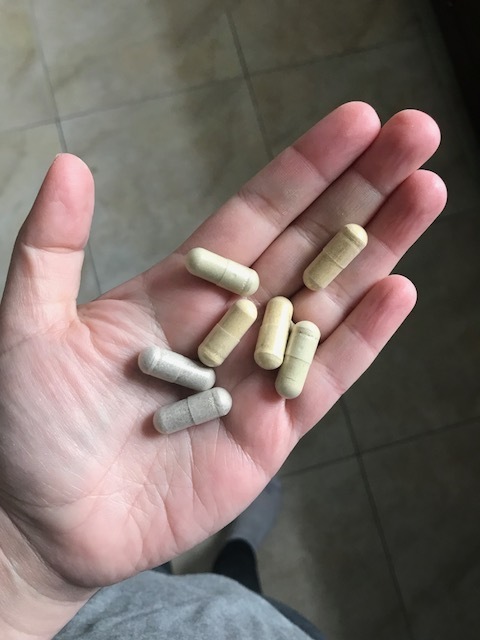 After my first appointment, I started supplements to help regulate my adrenals, liver and reproductive hormones. Within about a week of taking the supplements regularly, I could feel a huge shift in my body. My mood swings had regulated, I was able to make more rational decisions and was able to deal with stressful situations more easily. Even my husband noticed that I wasn't so quick to get angry, my patience had improved and I was more affectionate as well. Awesome! It looked so promising, and I was excited for my next round of acupuncture. I mean, who doesn't like having a little nap in the middle of the day, covered with blankets and a heat lamp, while soft tranquil music plays? Sign me up! Another cycle came, 32 days, and was just as painless as the initial one after my first appointment. But, as I mentioned and as life would have it, things didn't necessarily go to plan. My appointment was a bit delayed and I wasn't sure if I was supposed to continue taking the supplements as they were first prescribed so I was delayed in ordering another round of them, and the long weekend threw a wrench in everything as well! I just want to feel like myself again! Thankfully, when I explained this to Dr. Martens she was incredibly understanding. She just kind of gets it that life sometimes doesn't go as planned and even with the best intentions, sometimes you have to push the rest button. So that's exactly what we did. We did acupuncture to stimulate ovulation, I started taking my supplements (again) and was excited to see how things would go. All I can say is they didn't go as planned, yet again. My weight started to creep up, there were some unexpected stressful situations and I felt like a total failure at trying to get control over my cycles and health. The next cycle was awful and the pain returned with a vengeance. How did appointment #3 go? Stay tuned!